A white maple that once lined the Louisville and Nashville Railroad line in southwest Atlanta will soon become a home for one lucky bat family. Craig Stehle, a local educator, journeyman, and industrial designer, took boards hewn from a Westside Trail maple and fabricated a custom bat box. An ambrosia maple from the Westside Trail is assuming a second life as a unique coffee table by the hands of architect Robert M. Cain. A poplar was transformed into a beautiful table by Art on the Atlanta BeltLine artist Phil Proctor. The furniture and functional objects were created for a special cause: Lifecycle Building Center’s fourth annual RE:Purpose Silent Auction. The Atlanta BeltLine’s Westside Trail is nestled in a heavily forested swath of the city. While the removal of some trees was required to make way for the 3-mile multi-use trail and future transit, Atlanta BeltLine, Inc. (ABI) strove to minimize the impact to the tree canopy. Hundreds of large trees will be replanted along the Westside Trail as part of the Atlanta BeltLine Arboretum by Trees Atlanta. At the time, many trees were salvaged for future, as-yet-to-be-determined projects. ABI partnered with Lifecycle Building Center and Eutree to recover, store, and preserve the trees. This bat house, created by Atlanta artist Craig Stehle, was created from Westside Trail. Not familiar with bat boxes? Learn more here on the National Wildlife Federation’s website. Architect Robert M. Cain created this table from an ambrosia maple on the Westside Trail. Detail of Robert M. Cain’s table. While maples typically have minimal color variation and a very subtle grain, this particular piece is made of a filtch. A filtch results from beetles boring through the tree, releasing and cultivating fungal spores, and effecting colors and patterns as seen above. 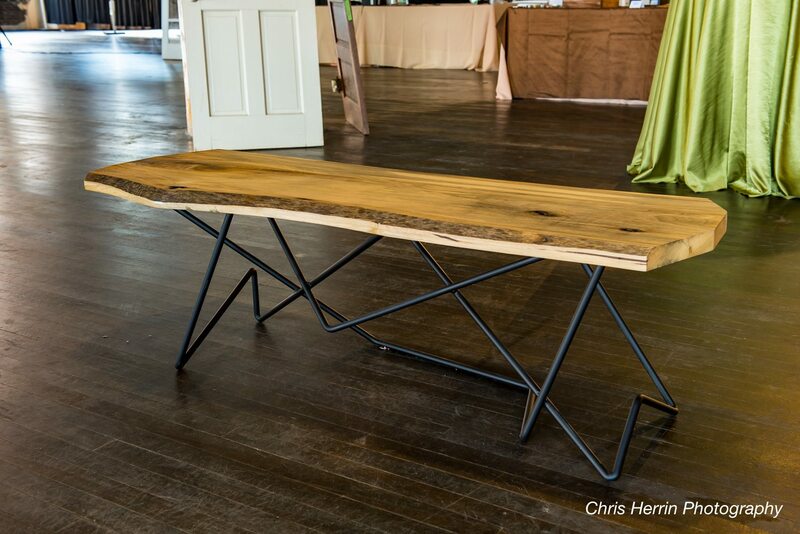 Phil Proctor, a sculptor and Art on the Atlanta BeltLine artist, fabricated the table below from a poplar tree that used to live on the Westside Trail. Phil Proctor, a sculptor and Art on the Atlanta BeltLine artist, fabricated this table from a Westside Trail poplar tree. Photo credit: Chris Herrin Photography. Lifecycle Building Center (LBC) is located on the Westside Trail immediately south of Murphy Crossing, the old State Farmers Market now owned by ABI. Their mission is to increase the efficiency and sustainability of built environment through reclaiming discarded building materials and selling them in their retail store. This saves construction materials from landfills while raising money for LBC to “fund grassroots community outreach programs that enhance resource efficiency on the built environment.” This education leads to greater awareness and demand for green building practices. Our Forest Free lumber is harvested from the logs of specimen trees that otherwise would be turned into mulch or dumped at the landfill. We work with local tree services to bring the logs to our mill in Cobb County. All on one site, we process the logs into flooring, paneling, slabs and other products. Then, we ship those products to our customers — who usually are local as well. The trees are marked with EuTree’s green stencil. Sims sprays the trees with blue paint to keep track of which ones came from the Westside Trail. The tree’s first pass through the saw. Rotating the log for the next pass through the saw. After the trees are trimmed, they are piled up on the loading dock to go into the warehouse. The trees are moved by forklift into the assembly line. The wood is cut down into boards. The boards are carefully stacked on pallets and spaced out in order to dry properly. More stenciling to identify the boards. A stack of completed boards. We will continue to follow developments as more trees from the Westside Trail find new, creative homes. In the meantime, take a peek at our Westside Trail construction album to get the latest visuals!